mint ice cream dipped in Belgian milk chocolate and caramelized sugar crunch. the mint Magnums started calling to me again! I keep wanting to try these but I keep putting it off. I always stare at the box but convince myself I already have too many treats at home to try first. Oh how I suffer so (not real suffering mind you). I checked the fat content on the back of the box. 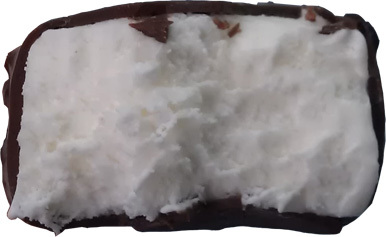 Like the other simpler magnum ice cream bars, this one is only 50% of my saturated fat for the day, and technically that's less the a serving of H-D. I guess that's enough of an excuse to pick these up instead. Shiny and unlabeled as always. Hey, where's my sugar crunch coating? I was specifically promised crunchy coating just three sentences ago. Is it just me or is that shell thinner than usual? I took a bite and while it's tasty enough, I am by no means blown away. It's well made, but where's the thick lovable chocolate shell? I'm also still looking for my crunchies. Even the ice cream inside seems off. It's a fine middle of the road flavor with a nice aroma, but it's lighter and fluffier than the other bars. There's no crunch, no mint tingle, not even a nice chocolate coating on my taste buds. What is going on here? Look again at the picture of the box and then compare it to the pathetic coating in my bar. Sure there are enough crunchies to add a little crunch here and there, but zero flavor is added to the treat. This just seems like any old treat, where is the Magnum flair? You get my attention with the green highlighted box and Magnum's respectable track record, and then you deliver a fine treat, but it's not a FINE treat. Let me put it another way: I wanted another one. It was good enough to make me want another, but it wasn't fantastic enough to be a fulfilling experience like the others. 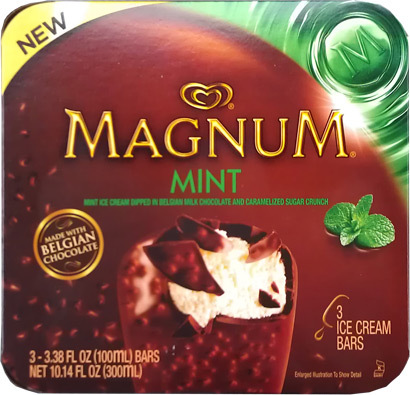 I know I am picking here, but just keep in mind I am comparing this to the other magnum treats. This one is fine if you love mint, this just strikes me as a 6-7 when it should be an 8 or a 9. This is a classic case of setting expectations too high. On Second Scoop: Reviews like this are tough because it sounds like I'm saying this is a bad treat when it really isn't. All I'm saying was I expected a certain thick-coated experience but found a much more practical product. I did notice the crunch a bit more on the second try, but it's not a crazy Nestle Crunch type crunch. The overall product is good, not great, that's all. Mint lovers will love it, the rest will enjoy, but just don't expect to be wowed, just be happy. I'm sorry this disappointed Dubs bc I swore on this one like the double chocolate! The shell was def thinner but I had a definate mouthwash of mint flavor in mine and tons of crunchies to the point of them going off like Pop Rocks in my mouth - me thinks you may have had a bad bunch! it was still respectable, just not awesome. I'm hoping the other two in the box are more crunchy. If not, I will write to magnum. I hope you find the HD spiced truffle soon; I am very curious to know how it is! have you had either the double chocolate or double caramel? The double chocolate shell is one of the best dessert inventions ever.